Have you or your child ever had head lice? If so, you know and understand how difficult it is to get rid of and kill live lice roaming around the scalp. There are natural remedies to help kill lice and stop lice infestation from happening. Did you know that over-the-counter products suggested by pediatricians or doctors don’t always treat head lice? You could be struggling with lice removal by using OTC lice shampoo. What’s worse is that the side effects that accompany some head lice treatment options can be just as unbearable as lice themselves. 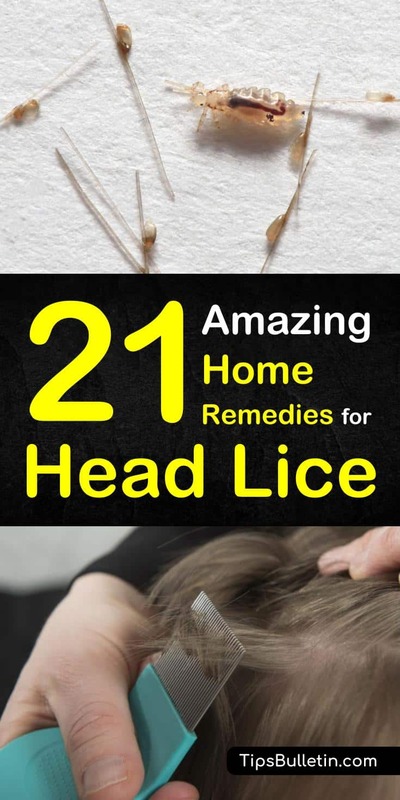 That’s why you need to find home remedies for head lice. Here, you’ll learn how to create homemade lice spray and natural lice repellent to help with all your lice problems. You’ll learn disease control methods that are affordable and efficient. Household items can act as lice treatment methods; you just have to find the right ingredients. For instance, vinegar has been known to help get rid of lice on children and adults time and time again. Gently apply distilled white vinegar to the scalp. Leave the vinegar on for a while and then rinse it out with plain water, no shampoo and no conditioner. Once you’ve rinsed the hair, apply a large amount of coconut oil. Comb out the dead lice and nits. We will be talking about many essential oils during this article, so there are a few things you should know before you continue reading. You should never ingest essential oils. Always dilute essential oils before using on a child or an adult. Have a carrier oil handy for diluting purposes. Test on your child or your hand before using on the scalp to see if there are any adverse skin reactions. If you or your child are allergic to a specific oil, move on to the next one on the list. Some children are allergic to tea tree oil, but severe adverse reactions have not been noted. There are two routes you’ll be able to choose from when it comes to essential oils: The olive oil route and the rubbing alcohol route. Mix the ingredients and apply to the scalp using cotton balls. Leave on the scalp for at least twelve hours before combing the lice out, rinsing, and shampooing the hair shaft. Mix the ingredients and pour the solution into a spray bottle. Saturate the hair with the liquid and leave it on for approximately twelve hours. Repeat the end steps of lice removal: Comb, rinse, shampoo. Olive oil can act as a lice treatment for scalps that have these pesky little bugs. Apply olive oil to the scalp until it is saturated. Once the olive oil completely covers the scalp, leave it there for about 20 minutes, as the oil will suffocate the lice. Rinse the hair, apply regular shampoo, and rinse again. Repeat until you no longer see lice. Tea tree oil is especially good at helping get rid of lice in a child’s hair. Add tea tree oil to a bowl with water and mix it. Once combined, put the solution into a spray bottle. This solution works best on a child’s hair, though it can be used for any person. Once you’ve applied the solution to the hair and scalp, cover the head with a towel or shower cap. Remove the towel and rinse with regular shampoo. Be sure to repeat this twice a week until the problem is fully resolved. 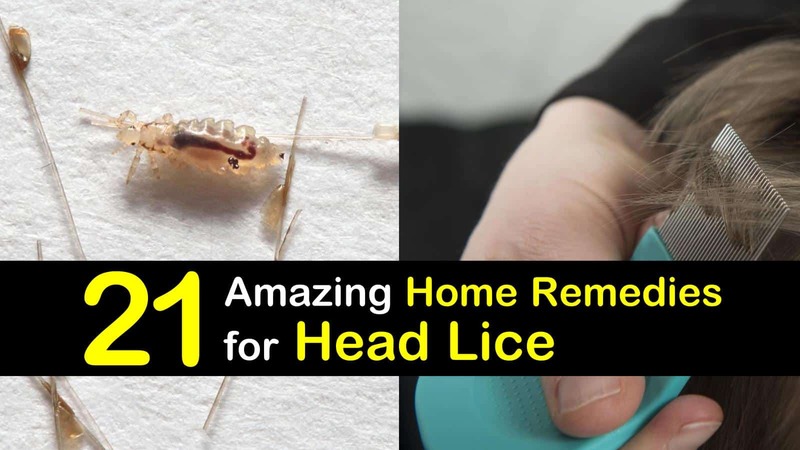 Natural home remedies for getting rid of lice and lice eggs are simple enough to find on the internet, but did you realize that something as logical and straightforward as garlic can do the trick? Grind the garlic and mix in the lime juice. After several minutes, the two ingredients will form a paste-like substance. Apply to the scalp of the person with head lice. Allow the paste to sit for approximately thirty minutes and then rinse it off with hot water. Wet-combing has been known to work for many years, which is probably why almost every parent uses it on their child at one point in their lives (if their child happens to have a lice problem). When wet-combing, parents can quickly pick out the lice, as they show up more clearly on their child’s head, and don’t resemble dandruff. Wet-combing requires spraying a conditioner onto wet hair and using a fine-toothed comb (sometimes a magnifying glass may need to be used). Though this process is time-consuming, it does get the job done; try getting some entertainment options out if you’re doing this on your child, as they may get bored and antsy. If there’s one thing that stops lice from roaming around the scalp, it’s petroleum jelly. Spread a small layer of the substance across your child’s scalp. Cover with a towel or shower cap and let it sit overnight. In the morning, apply baby oil and use a nit comb to get the nits and dead lice out. One of the best lice remedies to get rid of head lice quickly is to use a hairdryer. Though this technique may not be believable, as it’s one of the most cost-efficient methods to use, we assure you it’ll work wonders. Do not use this method on toddlers younger than five, as hot air on their scalps can be damaging. Make sure you do this outdoors, as you do not want the lice to spread onto the furniture and floor in your home. Onions are super helpful in the fight against lice. Instead of going to the drugstore to purchase a CDC-approved shampoo and conditioner, make some onion juice and leave it on your child or baby’s scalp for approximately four hours. Wipe the dead lice and nits off the scalp with a nit comb and rinse the hair with regular shampoo. Repeat this every few days for the best results. Mashing apples can get super messy, so be aware of your surroundings. It is one of the best ways to get rid of lice on your child’s head. Mash the apples and apply them to your child’s scalp. Leave the thick solution on the scalp for approximately an hour and then rinse like normal. Many recommendations for the smothering technique flood the internet. We’ll discuss the use of olive or almond oil. Separate sections of hair and lather your child’s head with either oil. Though the oil itself may not necessarily kill all of the lice, it will keep them in that one spot until it’s time to use the lice comb to get the pests out of the scalp. When separating sections, it’s easiest to use a hair clip to gather the hair that you’ve already soaked in oil. Be sure to continually rinse out the comb with hot water when using this technique, as the lice and lice eggs may build up. Once you’ve thoroughly done the entire scalp, rinse out with warm water, regular shampoo and conditioner, and dry hair. Do this once daily for a week and then keep an eye out for returning lice. Many tips involve using a towel throughout the process. Be sure to clean the towel in a separate load of laundry and use hot water. Also, clean the lice comb after every use. You can either use a 10% bleach solution or a 2% Lysol solution; let the comb soak for approximately thirty minutes before rinsing it very well. If you don’t have either of these solutions handy, you can also soak the comb in vinegar for approximately thirty minutes or boil it in water for about ten minutes. Mayonnaise may not be much of a wive’s tale after all, as it does provide relief from lice. Smother the scalp with this tasty condiment to suffocate the lice overnight beneath a shower cap. Rinse the next morning. Don’t forget to comb out all the dead lice, per usual. Coconut oil is always a good solution to use when trying to comb out knots in the hair, or lice, in this case. However, if you’re using it to remove lice from a scalp, you’ll have to load up and make sure you lather the entire head with the substance. Do not remove any of the oil, even if it is dripping off the head. Be sure to secure it with a shower cap, but do not use a towel, as this will defeat the oil’s purpose and likely soak up the substance used to kill the lice. Leave this on for approximately two hours and then rinse and shampoo. Once the hair is dry, apply the oil again and leave it on overnight. Use the nit comb to get out lice and eggs and rinse the oil out with warm water and shampoo. Repeat the process as necessary. All it takes is a few drops of neem oil, and you’ll be on your way to a lice-free head. Add a couple of drops to your regular shampoo and rinse the hair thoroughly when washing. Use the nit comb to carefully get all of the dead lice and eggs out of the scalp. If you choose this method, use it regularly for a few weeks to ensure the lice will not reappear. Do not try this method with babies six months or younger. Start by applying benzoyl peroxide directly to the scalp. Then, rinse the scalp and hair with plain water. It’s recommended you use a basin for this part, as the dead lice will fall into the bowl of water. Repeat this method approximately a week after the first treatment to kill any lice that are lingering. Salt and vinegar work hand in hand to help eliminate the lice situation. Salt acts as the antiseptic for you or your child’s head, while vinegar traps the lice and breaks down their nervous systems. The vinegar stops the lice eggs from being able to crack open and latch onto the scalp. Mix the two ingredients and put the solution into a spray bottle. Both white vinegar and apple cider vinegar will get the job done the right way. Instead of going to the drugstore to get your lice shampoo infused with lindane, use an ingredient as simple as baking soda to ease all your worries. Baking soda has been known to kill lice by stopping their respiratory systems from working. Combine ingredients and apply it to the hair in sections. Use a tissue to wipe off the eggs, baby lice, and adult lice from the comb you use after applying the mixture. Rinse with regular shampoo and be sure to reapply within a few days. There are still additional steps you’ll have to take to ensure the lice will not come back, and the first step to that process is keeping a clean home. Keep in mind; you won’t have to go into full decontamination mode. Lice do not typically live far from the scalp. Also, lice can’t seem to hatch at room temperature. Knowing those two little factors will make it okay for you not to go crazy cleaning the house. However, you will want to clean all products that have been close to the person with lice, such as hats, pillowcases, or brushes. Put stuffed animals and non-washable items into a plastic bag to suffocate the lice and eggs. Washable items should be placed in very hot water. They should then be put into a very hot dryer for approximately fifteen minutes. It may not be the most hygienic solution, but it is an option: Nitpicking. Though you can use a comb to do this, you can also use yours or someone else’s fingers. You’ll have to go through each strand very carefully if you choose this route. This remedy is very time-consuming, but it will be 100% chemical free. You’ll have to pass through the hair several times to make sure all of the lice and eggs are gone completely. Nitpicking may not work as well as other methods, but the same goes for drowning lice. What’s the good part about this method? It’s 100% free. You can try immersing the scalp underwater in the bathtub. This will likely get the back side of the scalp, but it is not probable that the top of the head will be thoroughly addressed. Though this method has not been proven to work, it’s still worth a try. You’ve discovered new and exciting methods for getting rid of lice on your scalp and that of your children. You’ve found that simple ingredients lying around the house like white vinegar, coconut oil, and petroleum jelly can solve all your lice infestation problems. What’s more, is that you can use these natural lice repellent tips and tricks to remove lice in the comfort of your home, you don’t have to go to the local drugstore, cash out, get your products in a plastic bag, and continue to be puzzled while reading paragraphs and paragraphs of instructions. Instead, you’ve found simple ways to remove lice safely and efficiently. We hope you liked our home remedies for head lice removal. If you did, please share our homemade lice repellent tips and tricks on Facebook and Pinterest with your loved ones.